I took this photo in southwest Detroit on Bagley Street, just down the street from Mexican Village Restaurant and Honey Bee market. The park has no sign saying what its name is, but it has a banner from the Detroit Greenworks Solutions, which trains under- and unemployed Detroiters for green jobs. It looks like something you’d see out in the country, but it’s nestled right in the middle of one of the city’s densest neighborhoods. The structure in the background was what I noticed first, but the railing out front caught my eye once I got up closer. I like the juxtaposition of the arches on the railing and the more square lines of the gazebo. In the photo up top, I’ve accented whites, blacks and increased the contrast so you can really see the detail in the railing as well as in the posts and lattice on the gazebo. Look closely and you can see white paint speckles on the railing. 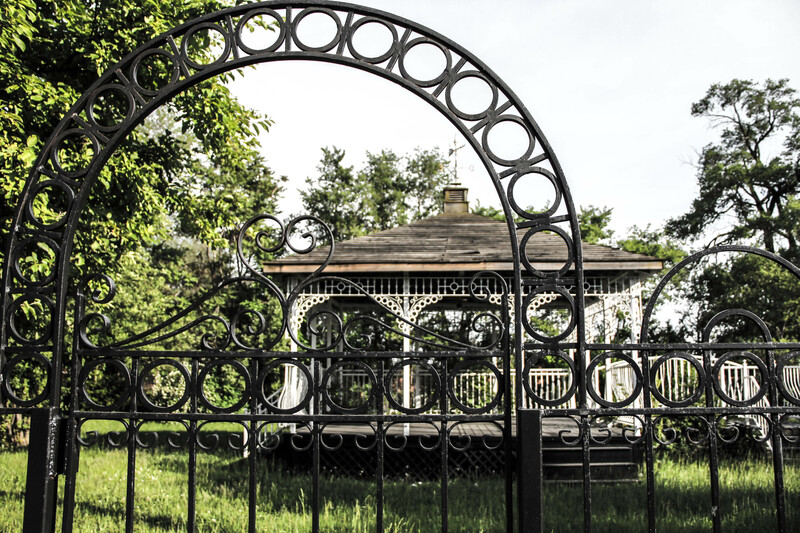 I love how the weather vane nestles into the upper right corner of the bigger arch, and also how the heart and iron loops at the center of the big arch interact with the white lattice woodwork at the top of the gazebo.